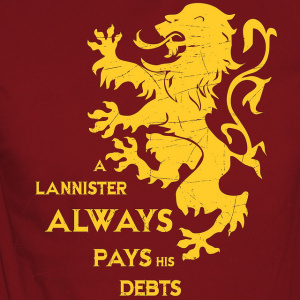 A Lannister always pays his debts. . Wallpaper and background images in the Game of Thrones club tagged: game of thrones house lannister a lannister always pays his debts. This Game of Thrones fan art might contain jezi, t shirt, shati tee, jersey, tee shirt, shati ya tee, sweatshirt, sleeve kwa muda mrefu, and kola muda mrefu.